In this series, The iPad Receptionist users share their experiences. Jessica Moore, from TripAdvisor travel planning and booking site, reflects on how The iPad Receptionist saves employees time and impresses office visitors. Why did you first consider using The iPad Receptionist? Moore: We’re an up-and-coming technology company, and we needed a higher tech way to greet customers from the first moment they stepped into our offices. The iPad Receptionist visitor management system fit well with the company and the image we want to project. We tried it first at headquarters, and it was such a good fit, we’ve made a concerted effort to roll it out globally across TripAdvisor offices. Did you know from the beginning that it was a tool you would deploy at other sites? Moore: As we became more and more familiar with the technology — and got such positive feedback from visitors and employees — we realized it would benefit our other office locations as well. We thought it would be especially useful at our smaller offices, which don’t always have a dedicated front-desk person. How long did it take you to implement The iPad Receptionist? Moore: Not long at all. It kicked off without a hitch. And the technology is constantly improving. At first, we just had a basic sign-in, and now our brand is featured on the iPad, too. The iPad Receptionist team is really receptive to our feedback, and they’re constantly improving the features that are already available. What was your procedure to greet visitors before you started using The iPad Receptionist? Moore: It was very basic. We had a visitor log that we kept on a clipboard, and people would sign in with their name, who they were here to see, and the date and time. We would take the log, look up the person they were there to see, and then send that person an email. We also had physical visitor badge cards, which was kind of a process. If an employee had a visitor, they would have to logout the physical badge, and we had to track all the badges at the front desk. How has your front desk changed with The iPad Receptionist? Moore: It’s definitely a step up! Having a cool, sleek iPad stand at reception enhances our image as an innovative technology company. Our visitors enjoy interacting with it. It’s a great device and a great presentation. The iPad Receptionist also saves us a lot of time, about 2 minutes per visitor. And that extra time really makes a difference. It allows us to provide a more personalized experience by going around the desk to take their jacket, hand them the badge, and greet them. Before, we would direct them where to sit from behind our desk and then look up someone’s name up on the computer to email them a visitor notification. Because that’s all automatic in the iPad system, we can interact with our visitors in a more personal way. So, it allows you to give each visitor more attention? Moore: Absolutely. The app works itself. We don’t have to spend time sending visitor notifications. Instead, we can greet our visitors, offer them a drink, do whatever they need. We also use the system for interview candidates, and it adds a wow factor. As an extra special touch, we give interview candidates a different badge from what we use for regular visitors. A lot of the interview candidates are recent grads, and they’ve never seen anything like The iPad Receptionist. They are definitely impressed. At the end of their visit, we collect their badges and thank them for coming in. This provides another opportunity for personal interaction. What feedback have you received from visitors about The iPad Receptionist? Moore: Our visitors love it! Our office is usually the first time they’ve ever seen a visitor management system. Most people are really impressed. They especially like the fact that The iPad Receptionist is hooked up to a badge printer and it only takes one second to print them a badge. Just this afternoon, one of our employees had three visitors from another company coming in. Two of them showed up before their colleague, who was running behind. I walked them through the badge process and showed them how to use the system. When their colleague arrived, they said, “You have to look at this.” Then, they walked him through it! They showed him what to do and explained all the features. They thought it was so cool. And we thought it was cool watching them interact with it! How have your employees responded to The iPad Receptionist? Moore: Our employees really love it, too. They especially love the text notification feature. For example, the facilities team is often running around, so they aren’t always at their desks when their visitors arrive. They find the text notifications really helpful. Texting frees them up to do their job without worrying about missing an email or a call. Anything else you’d like to add about The iPad Receptionist? Moore: The app is very user-friendly. It’s sleek and really gives people that wow factor when they come in. 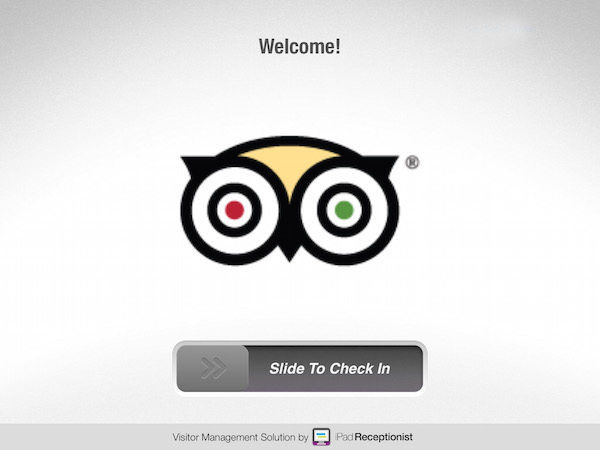 Overall, we find The iPad Receptionist is a great way for a high-tech company like TripAdvisor to greet visitors. Does your office need some WOW? Start your free trial of The iPad Receptionist.